If we’re being all dreamy and introspective, The View from Where I Write is unbelievably amazing. I have lived all over the world, and the places I haven’t been, I probably know someone is there… or has been there… or know someone who knows someone who is there. I met and married the rugby-star of my dreams, cute English accent and all. I have two of the cutest (and most dramatic) children God ever put on this earth. There’s not enough time to do all the things that I love to do in a day, but I’m lucky enough to get to attempt them… when I’m not falling-off-the-couch tired. There are friends near and far who I am lucky enough to call ‘mine,’ and ‘best.’ I can turn to them at a moments notice for help with anything from planning a wedding in Georgia from Shanghai, to getting a package to my dad. My sister is one of the most beautiful people to ever step foot on this planet- she will do anything for us, anytime, anywhere. In truth, I’m spoiled rotten. Now if you want the physical description of The View from Where I Write… it’s not as pretty. I’m in my office on Saturday afternoon because second semester starts tomorrow and, if we’re being honest, report card-writing got in the way of my planning. My office is plain with white walls and a light wooden door. I have a gigantic, official-lawyer-y type desk (just missing a nameplate) and a grey, uncomfortable couch that I’ve sat on twice since it’s been in here. There’s a space heater because it’s been cold in Bahrain and, every couple of days, my desk is completely hidden by papers I’ve printed. Today, you can still tell that it’s brown… in some places. This weekend, I went to the grocery store, took the girls to the park, made my first loaf of banana bread (yum, by the way), cooked hot dogs and grilled cheeses for lunch, had a pajama-party-movie-night with homemade pizza and cookies with the neighbors, and slept. I’m going to put a rather adorable picture of the Ladybug and Sprout playing dress-up. That was my view as I thought about what to write… so it counts (because I wouldn’t get very much writing done looking at these two…). Samantha's posting from Bahrain will be fun to see, in this new world of internet communications we are lucky to have so many ways to connect with people from all over and explore different cultures. Oh, Kelli, those girls!! I can't even comment on what you've written because the girls in their outfits are just too darn cute. I would be distracted by that view, as well. Can't wait to read more about your normal and very different expat life this month. P.S. – first loaf of banana bread ever?! That's pretty exciting. 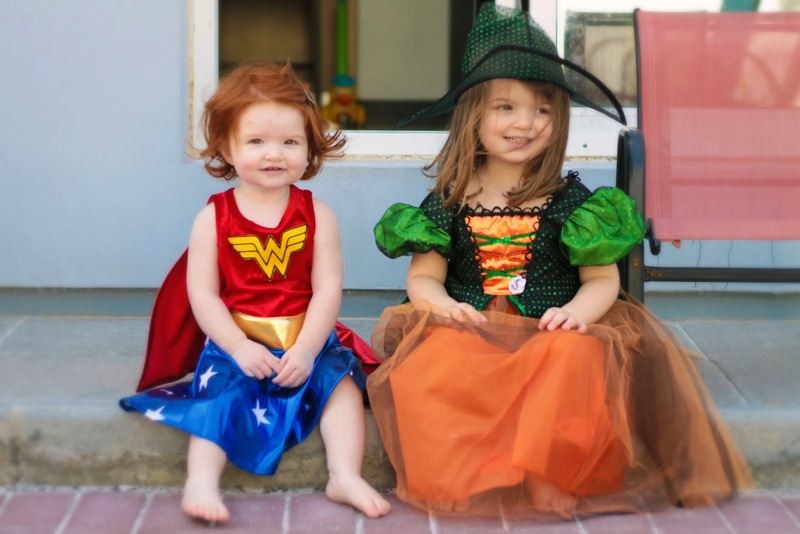 Wonder Woman and a witch – it doesn't really get much better than that, does it? Cute girls. I've never read an expat blog from Bahrain. I look forward to more! Fascinating entry—I agree with all that's been said about reading a blog from Bahrain. I look forward to it. Yeah I don't know why I've never made it before… I will be making it more now though! Thank you! I'm excited to read all the Australian blogs- it's on my bucket list but we haven't made it there yet! Those adorable cherubs are your children?? I'm so late reading these, but I had to start at the beginning. I'm looking forward to living adventures vicariously through your stories. The girls are absolutely adorable. Thank you 🙂 They're sleeping right now so I agree, they're adorable! Haha!